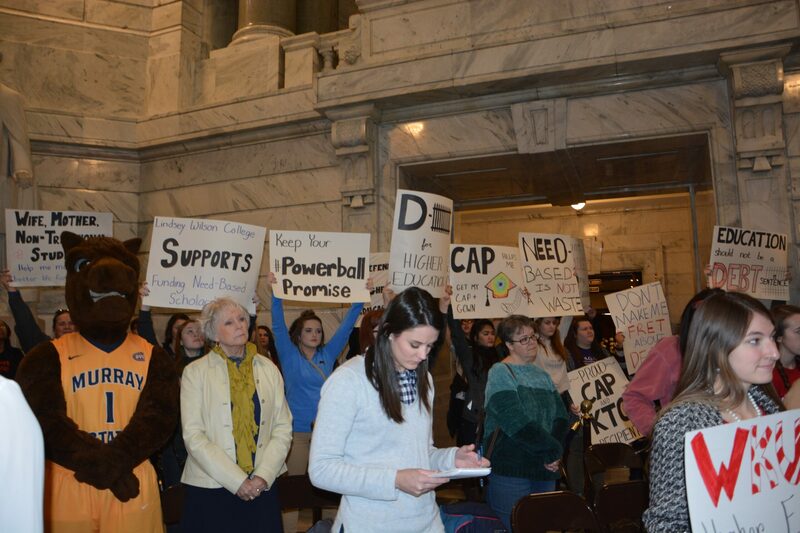 Kentucky public university students rallied at the Capitol Feb. 13 for higher education issues. The rally, led by Murray State’s SGA President Clinton Combs, focused on multiple bills being discussed this session. HB 118– Early and absentee voting. HB 127– Student freedom of speech. HB 249– Campus concealed carry. SB 7– allows carrying of concealed firearms without a license. SB 17– Expression of religious and political views in public schools and public post secondary universities. SB 107– Board appointments and gubernatorial authority. Another topic of discussion was the Powerball promise. The Powerball promise is the tradition of sending money from the lottery to education funds. State Representative James Kay attempted to restore $40 million to need-based college scholarship funds last year, but it was vetoed by Governor Matt Bevin. Jay Todd Richey, WKU’s student body president, described the lottery fund as a “piggy bank” for legislators and issued a call to arms for students. EKU student Ryan Wiggins has witnessed the effects of radical budget cuts first hand and asked legislators invest in students. Multiple state government officials spoke at the rally. Attorney General Andy Beshear said the solution to wage gaps, unemployment and job deficits is more college degrees. Commissioner of Agriculture Ryan Quarles encouraged speakers not to “point fingers,” but to take action. Quarles challenged the audience to know their representatives. Senator David Givens announced this session would discuss performance-based funding, where performance metrics would determine colleges’ funding. SB 153, which pertains to performance-based funding, was introduced Feb. 10. U of L SGA President Aaron Vance was pleased with the rally’s turnout. “I hope the message resonates. I hope it really does sit well with people like the governor and everyone in both chambers as we continue to work to invest more in higher education and to attain the individual autonomy of our state schools,” Vance said. Gov. Matt Bevin was not present for the rally. U of L student Carolecia Mobley saw a lack of representation at the rally. “I would’ve liked to have heard more about the minority groups, but overall I think it was a progressive thing to do for the community,” Mobley said. Good way of explaining, and pleasant post to obtain facts concerning my presentation subject, which i am going to deliver in school.